Easier to keep things simple when working in a pair! When I have a choice to make, if I am uncertain, I try to always choose the simplest of all the options I have. I basically look at the several paths and try to evaluate their complexity to pick the simplest. It is not only that I am lazy but more importantly that I realize it is often what works best. Now making ‘things simple’ is not that simple! I was at this web meet-up and was hearing this guy using the “Dead Simple” and “Stupid Easy” phrases every two minutes, this made me rethink this all-simplicity thing in the context of my work. I am currently spending a good share of my time reworking user interfaces, with the only goal to improve the User Experience of our software. This is a domain where having things simple is really super important and tough, as the software we work on is actually quite complex. I am working with a talented UX consultant on that project and its working pretty well. I am the product owner and he is the UX designer, but truth be told I am also designing a good share of the UI and he is owning a good share of the product. The collaboration works fairly well, even if I am sure we could improve. One of the reasons why I think it works well is because, alternately, when one of us gets enthusiastic about a solution or a feature, in many cases he would tend to forget the importance of keeping things at their simplest. Working in a duo helps you achieve this better. Designing a product is a work that is tricky: you can’t design a good product if you are not inspired and passionate, and it is almost impossible when you are passionate to keep this external neutral view on things that is required to keep them simple. Even the more talented product designers can tend to lose this. As much as we are all conscious of the risk of the ‘feature creep’ virus, we are never really sure not to catch it, especially when we try to solve complex problems. So that was my thought on this Saturday morning. As much as in coding, where it is now a clear statement that Pair Programming (the practice of having two developers writing the code at the same time) is what leads to the best code (if you do it right), designing with two might be what leads to the best design! I am not an expert in the field and some folks surely already use that technique and name, but if ever this is not the case, I would be very happy to be a pioneer of using it. Pair Designing helps you keep things simple; that is its first value! This entry was posted in customer experience management, experience, Uncategorized, UX on April 13, 2013 by Roland. I went through that post from Oliver Reichenstein from iA entitled “Mountain Lion’s New File System” that I found really interesting. Unfortunately I couldn’t comment on the blog so I decided to echo some of my thought in a blog post here. First, kudos to the author, this is the kind of post that I really like! Instructive, inspiring, and raising questions. I really recommend to any person interested by UX and UI. While the post is entitled on the Mac file system, I think it is not exactly the core topic – at least it was not for me. The core topic is how flat document organization is step by step taking over traditional tree based organization and how the “Tree” model doesn’t scale. A global recurring UX problem to solve! The interesting thing about this topic is that it touches every one, and it relates to almost all kind of applications. From consumer iTunes (as mentioned in the article) to very “Enterprise-grade” content repository (no need to explain that when you reach millions of documents in these time of Big-Data time, the nested-folder model is even worst). From photo software (think Aperture, Lightroom, iPhoto…) to business related applications (think crm, cms, project management with apps like Jira…). From file systems on a computer to native applications on an iPhone… and of course not to mention finding information on the Web or navigating through your email! 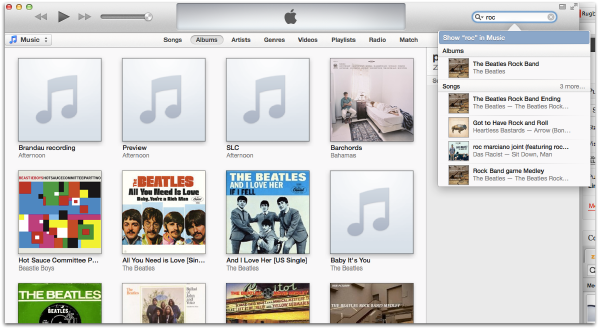 The new iTunes navigation, even no “tree like” navigation. Search is by far the main path to find your music. The way you classify, store, manage information is a corner-stone of all software user interface, and the concept as much as the problems are the same in many different places. Finding and accessing the desired information is a real problem, especially in this big data world where amount of both structured and unstructured content is growing exponentially, faster and faster. Search, finally a way to classify information that works? First content creator are not good at organizing their information on a large-scale. They can totally skip the classification step or be wrong or not consistent in that job. The classification plans themselves can evolve and change. Second, after all, what defines more a document than the data and meta-data it naturally contains? Manual classification in many case is asking the user to define something that is already present in the document. Email is may be the first place where this happened. It is at least where I started to notice it: highly unstructured content, the best practice of storing your emails in different mailboxes or folders and sub-folders worked for a few years but very quickly, the constantly growing volume of email made this simple operation both impossible (lack of time) and useless (not that much helping to find, as not consistent) and Gmail showed the way. The way was ‘a simple search’ combined with intelligent tagging. Now, me as many other users, are using their inbox as a global container where they keep their thousands and thousands of email, but simply use states (such as read / unread or archived) and tagging combined with search to retrieve them. Another very simple example that we all went through which very similar: the way we organise our file systems. For instance, I used to store my work documents under an organization where I would split document between Admin stuff and Customer stuff. I placed all my expenses documents in admin, after 6 months, I started to place customer expenses in the project sub-folder in the customer main folder… I ended up with something totally not consistent). This is just one basic example that happened to me so many times. Just an example where the user – me – changes the way he classifies information, leading him to an inconsistent organization. And I am sure this is true for all of us, I know it is not only me as I watched my friends and colleague and I see how they work. Defining a fix structured or even using a fix taxonomy simply doesn’t work that well. I guess humans are not made to manage information in that way, even the more precise and organized persons are failing here at some points! It is in fact way simpler to keep all that information in 1 level and forbid the creation of a 2nd level of sub-folders. Or forbid too complex classifications and let the search do the rest! And thanks to better search technology, this start now to be possible. Snow Lion showing the way? As iA mentioned in the article, OSX Snow Lyon made some significant progress in that perspective. The article from iA mentions a lot the iCloud capabilities. I am not an iCloud user, I don’t really plan to be one (even if this article has really seeded the idea of giving it a try…) but even without iCloud, the latest versions of OSX brought some innovation in that direction on the topic. My favorite one may be, in the finder: how spotlight has been integrated so that you can use the finder and order “All your files” accordingly to a range of criteria like Name, Application, Last Opened, Last Created… and combine this with a full-text search. This is brilliant. Unfortunately, on this one, we are clearly still early stage, it is really painfully slow when you search on “All your files” and not in a single folder (but this might be ironically due to the fact that all the files are not yet in a 1-level tree…). Still, it is damn practical and clearly showing the way and I am sure performance issues will be solved! Another attempt to make progress is the way applications are dealing with file versions. The removal of the “Save as …” in most Apple apps. and the management of the document abstracted from the file goes in the same direction. It is still I think very early stage and I have hard time to totally understand the real value (and still hates it on a regular basis…). This could also do a full topic for another blog post. Consumer Vs pro, should there be a difference? Back to iA article, the author speaks about how iCloud, the Finder and applications relying on this are benefiting from that new flat way to store and access content. However, they clearly say that in a professional context, it is not the same story and using the traditional tree of folders and folders and files is the way to go. That is also why they suggest both Dropbox and iCloud are different, one being a good fit for team work and the other for personal stuff. I actually challenge this. 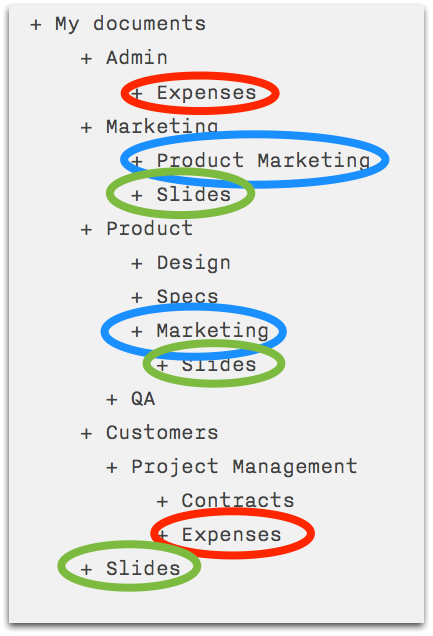 I don’t understand why, in a professional context, suddenly, using different of folders to define a structure would be needed, and more importantly, would work. Further more, I think that a professional context brings even more complexity, more information and more importantly more users which might have their own expectations of what the folder structure might be… in short more reasons for the organization of files to fail! So, as much in Dropbox than in iCloud or Gdoc, as much in you iPhoto than in your Document Management System, the future is certainly going more and more to flat organizations of your files and more smart ways to navigate and discover this and not only a simple classification plan such as a multi-level folder organization. In my job at eZ, building Content Management applications, we are really in the process of pushing search as the first way to discover content, before using the tree-based navigation. I hope to share soon some information about that. The article of iA brings also another idea interesting to discuss. It introduces the fact that, while accessing information IN an Application, the discovery of the right file is made easier (for different reasons). This is true. Using the application context to facilitate the activity of finding your document is surely very interesting and efficient (starting by the very obvious idea of not dealing with the file that are not to be open in this application). There is however a very close next step that is to consider that the document live within the Application. I really think this is a wrong and dangerous concept and while it might seem to be a good way to improve UX, looking at it from a higher level, it would not! Reason for that is that Applications comes and go, today iA Writer is my favorite writing application, tomorrow it will be another. It is key to preserve and use as much as possible open standards for documents. It is also as important if not more, to preserve open ways to access documents and manage them, independently from the application. Locking users to and in the application is not the way to go (even if I understand application vendors want to do so) and can only result in very bad User Experience on the long run! And here, unfortunately, Apple has been playing this game a lot, which is clearly starting to hurt end-user experience. For instance, I am personally into photo and I have been taking photos for some time. I have over the year a library of a few thousands photos. I used different configurations and applications to develop, manage and access my photos but the last 4 or 5 years, I have been with Apple Aperture photo software. This has in the end been very painful despite the many cool features Aperture could show. The upgrade cycle of Aperture has been hard to follow, sometime costly, the quality fluctuating a lot and the features not always really the best compared to competitors. Many time performances have been a pure disaster. In the end, the experience has been bad, mostly because, whatever I wanted to do, changing was not obvious, or should I say ‘using an alternative solution’ was not smooth. The library of Aperture, even if you keep the media out of Aperture, is creating a silo that you can’t access without Aperture and this is the main issue. Changing application means going for a real migration of your library. I decided a few week ago to finally drop Aperture and to rely on a software that is not dictating how the files are stored (I am going to use DXO Optics Pro to develop and navigate in my library). At any time my library will still be organized in the file system and I will be able to use any other tool emerging with no effort! I am very happy and excited about finally making this change! But lets stop here (I could actually write another whole other blog post about that). While I’m totally in for using context elements such as ‘which application is being used for a special document’, I think it is essential to let the system taking care of the documents independently from the application! Removing this would lead to only worst user experience in the long-term. There is enough room for progress in the operating system itself to stick to that! And note that this is also something true that does apply to enterprise software like document and content management. Users and organizations would get a lot of value of an open storage. Storing in a database is totally ok but storing in an obscure, not readable data schema is way more of an issue. Time to hit a conclusion, as I made this blog post way too long now, and doubt it has a very solid structure (but must more look like me talking to myself on all these interesting topics). I hope some will still have liked it! My conclusion would be that if Apple shows the way to go here, it is certainly via Spotlight. With the ever-increasing amount of information we are dealing with, structured or unstructured, we can not any more classify ourselves and we need tools to do that. We need tools like strong search engine, we also need tool more advanced and I am really looking forward to see if some of the promising technology around text and data analysis, semantic or not, can finally bring value to end-users. I would totally foresee topic extraction and mapping or named entity extraction and mapping as one of the technology to embed in the system for exploration purposes – auto discovery of the context. And more than ever, I look forward to see what will be the operating system of the future! Will Apple still show the way here? What do you think? This entry was posted in apple, innovation, IT consumerization, Uncategorized, UX on February 17, 2013 by Roland. I am not sure how Transparent Content Management did in 2012. I am also not sure if any thing big really happened this year in Content Management, rebounding on @piewords prediction post! Anyhow here we go for a round of predictions for the year to come, going beyond Content Management! I decided on ten of these, a good number, faster to read, faster to write. There will be a wave of customers with empty ‘Enterprise Social Networks’. Just like what happened ten years ago with portals, enterprises will have a hard time getting employees to use these tools when they are just an internal replica of the public social network. Why would people go there when they can go on the public ones? Just like Plumtree who ten years ago launched a “No Empty Portal” campaign, some vendors will focus their marketing on trying to have their customers using the software to deliver on the promises of the social enterprise… but will fail. In the meantime, more creative vendors who have the feel for a good mix of social features with more Enterprise functionalities, without simply cloning what’s happening on the public side, will really strengthen their position on the market. Fifteen good years after its creation, the ASP acronym will make its comeback. “Application Service Provider” is actually very explicit and people will use it to escape the loud and confusing terminology revolving around cloud computing. ASP will be big in 2013! The expression’s sun will set. Don’t use it in 2013 or you will be perceived as old-fashioned. ‘Mobile’ doesn’t mean much anyway; most of the devices are now mobile but still very different! For instance, the iPad screen is much closer to my grandma’s desktop (actually it is way bigger in number of pixels…) than to a mobile phone. “Mobile first” will be abandoned for things like “Touchscreen First” or “All Screens First” or something of the sort. This prediction can almost be used every year but it will keep happening, yes, e-commerce will keep booming. Beyond traditional 100% electronic commerce, new hybrid shopping experiences will be developed more and more and they will be a major driver for e-commerce: car services ordered and paid online, in-shop buying but online paying, local food delivery and pick-up on the mobile device… This also means it will be more and more difficult to tell the difference between electronic and traditional commerce. After serious buzz, people will want to understand what is behind Big Data and they will understand it is not a phenomena that touches everything and everyone, even if it is clearly a major disruption. Big Data will change over to more concrete technology topics, related to data manipulation and data analysis. “Big Data” will lose 30% of its popularity on Google search and the BD bubble will progressively decrease. Marketing Automation is an amazingly promising set of technologies but it also has a hard time delivering on its supposedly very measurable promises. In 2013, Marketing Automation will solve this by integrating more seamlessly other online marketing software. It will suffer from the move to mobile usage which makes it more difficult to track users. It will also suffer from some data privacy programs that will hurt some of the techniques they use. Some vendors will stay on the side of the road when others will really understand this and reach success by shaping a new generation of Marketing Automation more focused on inbound marketing and self-service integration. I don’t know if I will hate it or love it, but in 2013, the Fridgdle of Amazon will make its really successful debut. Fridgdle is the home device that probes what’s in your fridge and recommends grocery items. The Fridgdle, based on the same technical platform as the Kindle, will be a 7-ish inches tablet-like device that magnetically attaches to your fridge and comes with a Bluetooth-connected in-fridge camera to detect the level of stock. 2014 will be the year of mass production. Five years ago, being Open Source was a huge Marketing and Sales differentiator for vendors using this model; to the point that some vendors decided to go Open Source only to surf that wave. As it has already been discussed in many places, Open Source will be less and less present in Marketing and Sales folk vocabulary. The number of mentions in business articles will seriously decrease. It will be mostly a technological thing, related to how software is developed and how it works with little impact on how it is sold. While this will hurt some Open Source vendors, it is I think a good move; it takes Open Source value back to where it should be, not a sales or marketing criteria but a best practice when it comes to developing software, a technological characteristic which results in quality and innovation more than in super low costs. I do expect this trend to be a good one, a sign of maturity for Open Source vendors doing it the right way. Since Github got this massive $100M funding, we didn’t hear much about them, did we? We will soon see concrete results of this funding, which will go beyond Github’s usual territories. This will obviously be about collaboration and about building software and this will definitely tread on Atlassian’s territory. I can’t predict exactly what will happen, but certainly it will involve development process, allowing a lean and agile way to build software. Github will also explore continuous testing and building topics. These are my quick 10 predictions for next year. I look forward to seeing what comes true, and how! 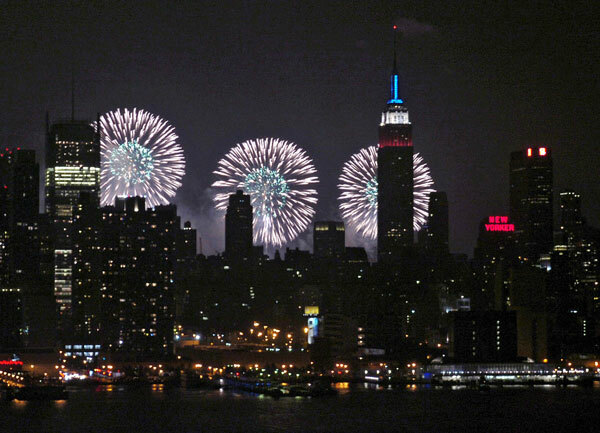 In the meantime, Happy New Year to all, Happy New Year New York and see you in 2013! This entry was posted in amazon, github, predictions, Uncategorized on December 31, 2012 by Roland. I think I should eventually ban these three letters from my vocabulary and make the effort not to use the term, or way more carefully. I think, eventually, we should all make the effort. I realize more and more the term is a source of confusion and one of the least understood disciplines of online marketing. In almost 3 out of 4 discussions where I would use the term, the person I am talking to has a different understanding of what SEO means compared to mine. More than that, there is a real sentiment about the term. People are really opinionated about it in all directions, without always knowing what it is about in more detail. Maybe I should call it “Natural Traffic Generation” or something of the like. A natural first step taking to demand and lead generation. One evening not long ago for instance, I had dinner with a fellow content management consultant and we were talking about the relaunch of the online marketing activity for a company he works for (including website, email marketing, etc.) to transform it into a demand generation machine. When I mentioned that the current SEO was terrible and an important thing to do was to focus on it, my fellow partner tended to depreciate this view as if it was not what really mattered, which I found in the moment a bit annoying, especially in regard to the potential for a minimum of search engine marketing for this case. After giving it a second thought, I think my discussion partner simply didn’t understand what I meant, because SEO was so much something else in his way of thinking, and not what I understood. I think he was obviously thinking of old SEO techniques of cheating search engines and that is all that was associated to the discipline. Most of the people just don’t get what modern SEO is and how SEO has evolved. I had similar confused discussions many times and I am sure they happen every day to plenty of people. Which serious Online Marketer would skip the opportunity to generate more natural traffic? Maybe the one who simply doesn’t get the the exact purpose of SEO. Yes, as a start, the name should speak of the goal and not the action! Don’t optimize for the sake of optimizing. It is just a means to an end and the overall goal is clearly to generate concrete real demand or traffic. Search is here and here to stay in users’ habits. My intention is not to demonstrate this (plenty of resources such as this blog post – 24 eye popping statistics about seo will give you some good hints about the role of search in inbound traffic). In this period when everybody acknowledges the power of Content Marketing, no doubt we are talking here of something crucial for online marketers. I have seen marketers happy and satisfied when seeing in their SEO dashboard that their domain name was showing a better authority than its competitors or even that their ranking on their brand was in top position, stopping then any effort and considering the SEO task completed… (don’t ask me why this is not enough, please). This clearly means the purpose of SEO is in many cases not understood. The only deliverables of the discipline is traffic and how this traffic behaves further on in your funnel. This is the only thing that can help assess the quantity and quality of the demand generation machine you’re building! That is in the end the only thing an Online Marketing Manager should look at. Having worked with some good SEO consultants (full disclosure, the folks at Distilled NY; I am not at all an expert myself), I realized SEO could be much more than optimization, but really working hand in hand with the content and information architecture. Organic Traffic Generation is all about how you plan and organize your content, how you dress it in the different places it will show up, how you plan it on a editorial calendar. So to speak, it is Information Architecture, but looked at through the lens of the global online world and not simply through the one of a single website. SEO makes your content behave well online! SEO will make sure your content behaves well online, and this is key! If you stick to a site-centric information architecture, you might miss some very important things which won’t make it perform as much as it could. Things such as basic optimization of your SERP (Search Engine Result Page) are all about that: look at how your content appears in a search result page, in a twitter feed, on a Facebook wall, etc. Ironically, today, by having your content well-understood by machines, you will have a good chance to have it well understood by humans. We can now design our content for both humans and machines at the same time, and this is may be the biggest change in what we call SEO. Time to wrap-up and summarize. Dear industry experts, Distilled, SEOmoz and company, please come with a solution to change that term for something less confusing! On my end, I will try to use it less, simply because I realize most of the people I talk to have an unclear understanding of what I mean. Instead of that, I will talk about Organic Traffic Generation, the first stage of the online marketing rocket (advertising being simply a booster, in my opinion, but this is a different story). This entry was posted in content marketing, online marketing, seo, Uncategorized on December 2, 2012 by Roland. Next month, I’ll be in San Francisco for the AIIM conference, invited by the brilliant Laurence Hart to participate in a panel with some fellow ECM practitioners from more traditional ECM providers as well as from emerging cloud-based services. Visit the AIIM website if you want to know more. Of course I hope to see you there! I look forward to this discussion, as the topic is interesting to me and comes right on time: Lately in our industry I have read a lot of things which tend to oppose “cloud-based solutions” and “open source solutions” and describe them as exclusive. 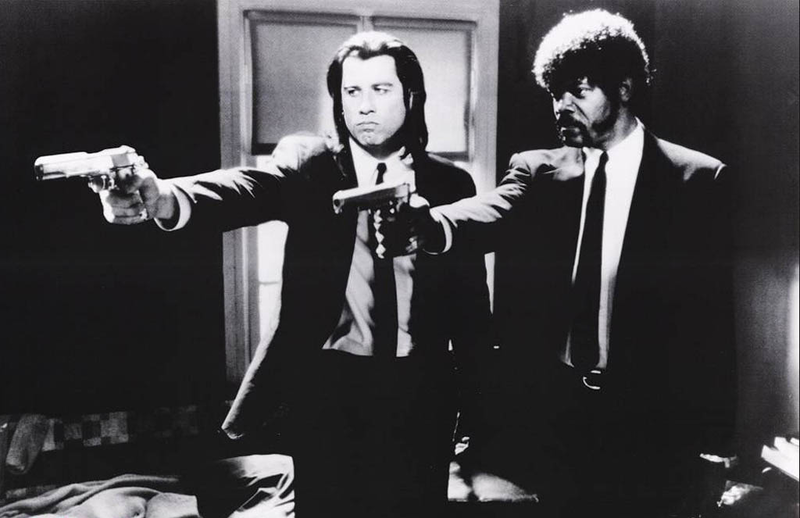 It first started with some business analysts. Often these people want to put us software makers in very limited boxes; which I understand – it’s their job. I never really understood why eZ Systems (where I worked before) and Nuxeo (where I work now) but also Acquia, Alfresco, Liferay, Hippo, whether it is about ECM or WCM, should be in an “Open Source” box, and not simply in an “Emerging vendor” box. To me, it is for their features first that both eZ and Nuxeo should be considered (or not) for a project, not for their open source characteristic — features including those functional, technical and economical. So as much as I hardly understand the “open source” box now, I don’t really understand why we, “open source vendors”, are opposed to the folks in the very wide and undefined “cloud” box, as if both cloud and open source were mutually exclusive. Hopefully the discussions will be about how cloud-based services and other solutions, originally more driven by individuals than organizations, might impact ECM solutions. I have my vision about it and to me, it is an interesting topic to discuss. But for now I won’t speak about this topic. I will keep it for later and will stick to the “cloud vs. open source” topic. 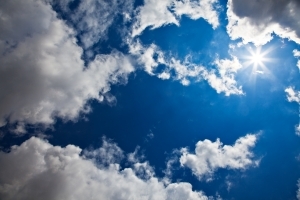 I have just read John Newton’s blog post “Cloud vs Open Source? I don’t think so!” which came as a reply to Lubor Ptacek’s predictions for 2012 which I also read (Lubor will actually be part of the panel mentioned above). Will we speak less about open source in 2012? Well, maybe yes, as it’s becoming less of a buzzword, at least as a differentiator and more of an established model, but it certainly has nothing to do with cloud. Companies like Nuxeo and Alfresco are obviously (emerging) competition to big players like OpenText and they are growing, gaining marketshares, and becoming more and more important competitors. Their solutions are, by the way, obviously more modern and thus naturally fit better in a cloud world (and no I won’t say here which one fits better in my opinion 😉 ). So no, nothing to do with cloud indeed! Back to my rant… Why do we still need to explain what open source means? Please stop that, and step up the discussion! Open source is not a business model. Open source is a development model. Are we still talking about that? It is known to make better software. It doesn’t guarantee it makes good software by itself, and through different open source projects, you might find good and bad solutions. Being a cloud solution has nothing to do with these development considerations. The cloud is about how to deliver software as a service at different levels, from very end users to developers and sysadmins. It is about distribution and business models. Ask a small company like Automattic with a not that small of a product and you’ll understand both are extremely compatible! People in our industry opposing cloud and open source should stop doing so. This makes no sense! I somehow understand Lubor’s perspective, because OpenText obviously is a bigger and more established player, and isn’t in the cloud or open source areas. But dear analysts, reporters, practitioners, and consultants: please understand we are not talking about the same thing here and even if it is tempting, please don’t fall in that trap of mixing up the two. This is like if I would ask you “Do you prefer organic coffee or espresso?” The first is about how the coffee is grown, the second how it is poured. Back to content management. Whether on-premise or on the cloud, open source technology will provide a range of benefits more or less interesting for you depending on the window from which you look. In the enterprise world, I see the hybrid on-premise/cloud deployment model as probably THE scenario we will see a lot in 2012-15 for this industry. I must say I share this prediction with Lubor. And in this case, definitely open source will help! This entry was posted in Uncategorized on March 1, 2012 by Roland. It all starts here: trying to explain the different flavors of cloud computing to some not-too-IT-immersed folks… Truth is, if you’ve ever tried to do this, you quickly realize that it’s a bit of a challenge as you first have to cover the basics of SaaS, PaaS, and IaaS! And (another truth be told), I would not say these are totally clear concepts yet and they will probably never be, so in order to explain well, you have to make things simpler than they really are. If you disagree, please comment on this post! 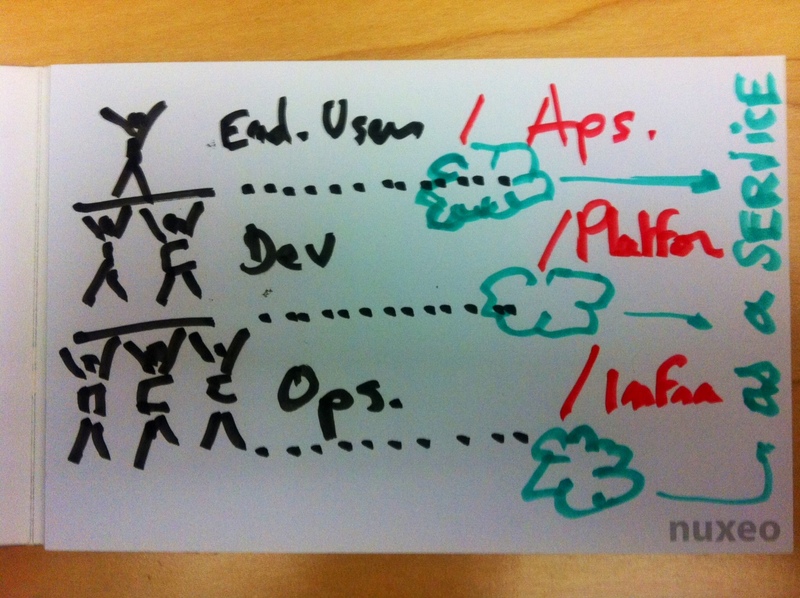 So the best way I’ve found to explain these 3 layers of aaS (namely Saas, PaaS, and IaaS) to the non-IT folks out there is with the help of visuals, in this case, an Image + Short definition of my own + Slogan + Examples. My image representing Software is a pyramid, where on top, stands the end user, below him are a couple of developers developing the app that the end-user is using. Below these developers is an IT crowd made up of system admins and other operation folks making it possible for developers to develop and then deploy their apps! Ok, in the real world the pyramid should be inversed. It should have more users than developers, and more developers than ops (at least most of the time), but I like the image like this. If ops fails to keep the infrastructure solid, both devs and end-users collapse; if devs fail, end-users collapse. A bit abstract, perhaps? Not a good drawing? And, maybe you’re wondering what this has to do with Software as a service? Let me go straight to the explanation by jumping to definitions. As mentioned, standing at the top of the software pyramid is the end-user, he is the king, per definition. His experience is what makes software great (or not). SaaS, which stands for software as a service is all about serving him, in the cloud. SaaS is about providing our end-user “king” a useful application in the cloud without having to deal with the technicalities of its development and its infrastructure. Want a good example? Well, Salesforce initially invented it! Their CRM application, designed specifically for the sales force, freed the end-user of the burden of having to think about software installation, configuration or even updates. It enabled a consume as you go environment, giving Power to End Users! Talking about cloud content management, we can look at WordPress.com and see how the nice folks at Automattic have managed to deliver this as a service without having to dive into the nuts and bolts of the famous blogging software of the same name! Let’s jump one level lower and discuss PaaS, which stands for Platform as a Service. In this realm, it’s not about end users but developers. PaaS brings Power to Developers. Here, they no longer need to think about the infrastructure, which comes to them in the Cloud, simple, straightforward, and on demand! Example? Well, here again, Salesforce did it well when releasing Force.com. But other kinds of examples of this method of implementation can be found at CloudFoundry. In another flavor, what we do at Nuxeo, with Nuxeo Cloud, tackles the same concept—enabling developers in the cloud to build their apps in a simpler way. And going down one more level, to the foundation, we hit the IaaS floor. This is giving Power to Sysadmins. Developers will still develop as usual, they will use “servers”, “database”, “file systems storage”, “web servers”… all these tangible pieces of the system stack will not be hidden & abstracted from them. This also means we still need sysadmins to care for these systems, as we all know developers should focus on the application layer (ok, I know this is old school and I know there is some overlap between developers and sysadmins with disciplines like Devops, but let’s not get too far into that, otherwise my explanation will be hard to digest…) IaaS is simply this: it’s all about giving more power to ops! This one is the easiest to provide an example for! Amazon with its AWS business is the obvious example, as well as a pioneer and by far the leader in this sector! But isn’t PaaS and IaaS as much about software as SaaS? Definitely. Hence, if you ask me, the need to rename the top layer to AaaS (Application as a Service). 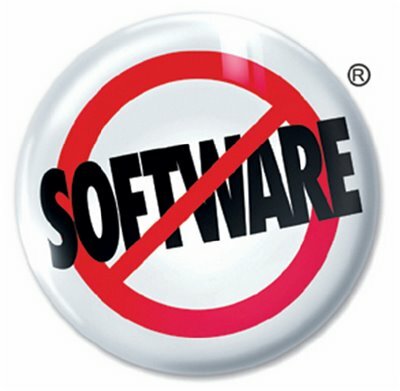 After all, Salesforce.com, probably the inventor of this layer itself has this strong and purposeful slogan: “No Software”…its about applications here, not about software, wherein A/P/IaaS all fall into the bigger SaaS basket. And now I’ll just wait for the evil techie who introduces API as a Service… but I should probably stop here! This entry was posted in Uncategorized on January 13, 2012 by Roland. So here we go, what’s next for Content Management? I believe 2013 will be the year of Transparent Content Management, that’s my prediction—my only one. I won’t say it is “The year of Mobile Content Management”, “The year when the Web 3.0 reinvent Content Management” or “The year the Cloud made it to ECM”, but simply the rise of what I would call “transparent content management” (some might have already use the term…). I can say it another way: 2013 will be the death of Enterprise Content Management as a standalone entity! Enterprise Content Management will really become one of many horizontal pieces of the multidimensional puzzle that make up Enterprise Information Systems, just one piece of technology and processes that will be reused by all enterprise applications, in a transparent way to their users. Enterprise Content Management will expand out of its original silo to all area of enterprise architecture, to a point where it almost even doesn’t exist by itself beside the technology layer, a one that talks only to architects and developers building apps. More recently, I remember the words of Dries Buytaert, the young guy behind Drupal, giving a talk entitled “R.I.P Content Management System” at SXSW 2010 (see a cmswire note about it). At the time, now almost 2 years ago, I was working for eZ Systems, a WCM Open Source company, and Drupal was of course starting to be one of our serious competitors even if we kept saying “we are Enterprise and they are not…”. I was (and still am) disagreeing with the headline of this talk and think it was buzzy and opportunistic, implying Drupal killed the WCM market, which was certainly not true (no one did) and the content of the talk itself was actually quite different than what was implied. But somehow now I must acknowledge Buytaert was a visionary at least in the headline. Beyond the “surfing the acronyms” wave, I truly believe the shift from WCM to WXM is a real one. Yes, you can manage the experience of your visitors, customers, collaborators online. No, I don’t think you really manage content—you use it, you leverage it, you benefit from it—but you don’t manage it; and WCM really became about that: managing and controlling user interactions on web channels! Of course this requires interactions on content, but also many other things as well (many of which ECM is not about, see my post about it). And now, after 13 months at my new job with Nuxeo, focused on building an Enterprise Content Management Platform, I can only assess that ECM is going through a similar shift as well, and give credit to my uncle and Dries. ECM is evolving to something else, something that doesn’t exist by itself, something that is more deeply linked to real business processes, more scattered into enterprise applications and information systems. What our technology helps manage is not content and documents but real business and organizational processes. Name some? HR processes, specific business asset management, invoicing processes, customer relationship management, e-librarians, contract management, customer support… you want more? I could certainly go on… but I won’t as this post is already way too long! So, while I love to contradict people who tell me ECM is a technology and answer them by saying, “you’re wrong, it’s a process,” I might rewind… Content Management is not anymore a process by itself, it’s an integral part of almost all business processes. That is part of our vision at Nuxeo, to move from traditional ECM to ECM platforms enabling the development of business apps that are content-centric. It is like “Communication” and almost as important. If Communication is king, Content Management is Queen, and together they can enable any business and organizational process. And this way, content management will be everywhere, but transparent, users won’t have to know about it! On this note, I wish you all a happy new year from new york and would love to hear about your retrospectives and predictions for 2013 or 2012! This entry was posted in Uncategorized on December 30, 2011 by Roland. This is my blog where I will, when I feel, share some personal insights on and from my work in the fields of Content Management. 10 years ago, we were already in the Experience Management business!